Team Nicaragua 2014: We’ve Arrived! Hello from Nicaragua, from Todd Lester! In general we had a good day of travel. The traffic to Toronto Airport was excellent and everyone arrived in good time. 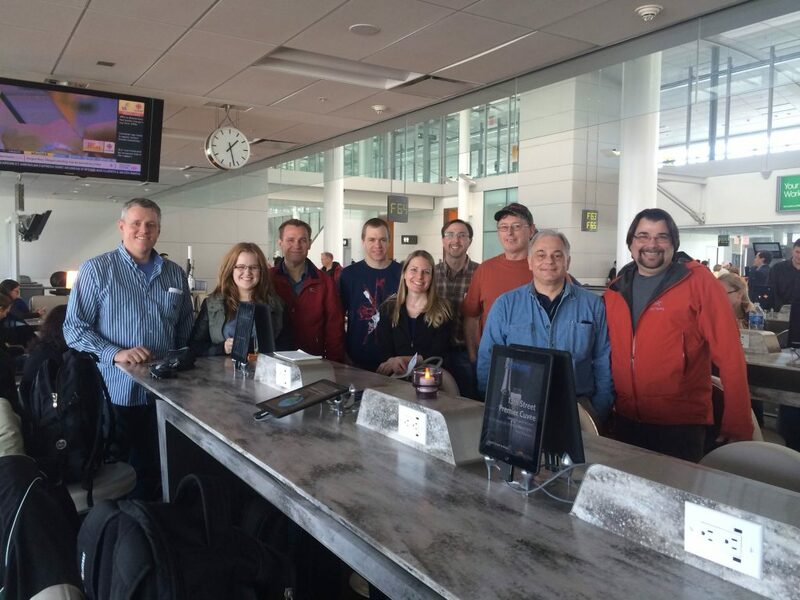 The line-ups through Toronto airport were very short and we made it through flight check-in, security and to the boarding area in record time. We all had a light lunch in the boarding lounge. By the way, the new terminal at Toronto airport is quite amazing and very modern. You can sit at a table and order your lunch from an iPad. What will they think of next? Our flight from Toronto to Houston was on a smaller aircraft (only 66 passenger capacity) so it was a bit cramped but we made good time and the flight was very smooth. From Houston to Managua we flew on a Boeing 737 with all the modern amenities including a small monitor in every seat from which you could rent movies to help pass the time. However, when we boarded the plane in Houston the captain informed us that there was a mechanical problem and the flight would be delayed 30-40 minutes. The delay ended up being more like an hour. 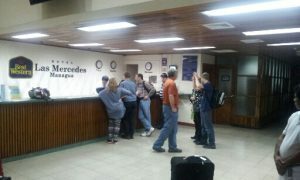 We arrived in Managua an hour late so it was 10:45 p.m. Nicaragua time (which is about 11:45 p.m. Kitchener time). However, no one complained and no one seemed that tired. Edgar Cordoba, the President of the Nicaraguan church, was there at the airport waiting for our group to arrive. He had arrived at 8:00 pm and since our flight was late he ended up waiting for us for three hours. It was kind of Edgar to stay and greet us and show us over to our hotel. For the first night we are staying at the Best Western hotel in Managua which is right across the road from the airport. It is a very nice hotel and has a beautiful pool too. We stepped out of the airport into a very warm and humid night. I would guess it was above 80 degrees Fahrenheit (27 degrees Celsius) even at midnight. Everyone is excited and in good spirits. We are meeting for breakfast at 8:00 am tomorrow (Tuesday) and then we are going to pick up our van, load it up with all of the supplies that Westheights congregation so generously supplied, and drive to Masaya where we will be staying for the two weeks. I am sure the day will include some unexpected adventures and we will keep you posted of how things develop. Keep praying for us as we appreciate knowing that we are not here alone. The Lord is with us and our church family is praying for us.